Flying With Diabetes Day 2014 - 1st November; IWM Duxford. We enjoyed an excellent "Flying With Diabetes Day" on 1st November for over 100 attendees. A huge thanks to everyone for coming; to JDRF for advertising the event and registrations, to the speakers Kyle Rose, Malcolm Knowles, Dean Horridge, Claire Williams, Karl Beetson, Jo Brodie and Gavin Griffiths, to "Mad Science" for entertaining the younger members of the audience and to the IWM Duxford Airspace Conference Centre for the venue and catering. Also huge thanks to to our Silver Sponsors Dexcom, Medtronic Diabetes, Nipro Diagnostics, Roche Diagnosics and Bronze Sponsor Sanofi Diabetes for making the event possible. We're delighted to have raised over £2,500 for JDRF. A very enjoyable day! We’re also delighted to report that this £2,500 brings the total raised for JDRF to over £100,000 since 2009 – a huge thank you to everyone for helping achieve this figure! 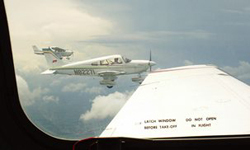 Diabetes Formation Flight USA (www.dffusa.org/2014/) a formation speed record by four aircraft was successfully completed on Saturday 28 June between Lincoln, Nebraska (KLNK) and Cedar Rapids, Iowa (KIOW). 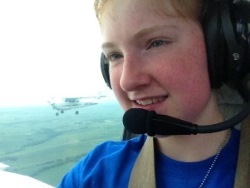 All aircraft were flown by pilots with type 1 diabetes; Douglas Cairns in a Beech Baron, Jason Harmon in a Cessna 172, Chris Isler in another C172 and Taylor Verett and Brian Strack in a Piper Archer along with Kathryn from Illinois, also with type 1 diabetes as a passenger in the Baron. Total time was 2 hours, 5 minutes and 15 seconds for an average speed of just over 113 knots. Training was held at Council Bluffs Airfield, Iowa (KCBF), over two days immediately beforehand with two flights each day, practicing formation positions so we could all start and finish simultaneously for the speed record, and "break to land" at Iowa City where we started the "Fly Iowa 2014" air show at noon. Some humid Midwest weather and thunderstorms delayed training on Thursday 24th June, but on the speed record day itself, we were lucky as heavy rain and storms cleared southwest of Lincoln, and low cloud and visibility cleared in eastern Iowa as we headed towards Cedar Rapids. The first hour was spent in smooth and increasingly clear conditions, but we had to descend near Omaha and carry out much of the remainder of the flight under broken cloud base at 1500 feet above ground. As ever it was an extremely enjoyable few days together, and an excellent example of showing what can be done with diabetes with a good system/protocol for flying in place. Many thanks go to Amy Francis and Michelle Wilson at Lincoln Airport Tower, Tim Ryan at Omaha Approach, and Greg Bardsley and Lawrence Darling at Cedar Rapids Approach and Tower respectively – your help was much appreciated. Thanks also to Advanced Air Inc., at Council Bluffs Airport for help with preparations and rental aircraft. It was also a real pleasure to have Kathryn with us for the speed record and parents Jenny and Rick during training (who dashed by road from Council Bluffs where we launched from to Iowa City to witness our break-to-land at Iowa City). We look forward to next year's project!